This week at Penguin Market I will be working with Polymer Clay. 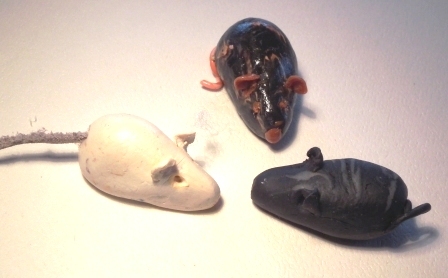 I have been making decorative mice for cheese platters (pocket pet mice for children) for many years. 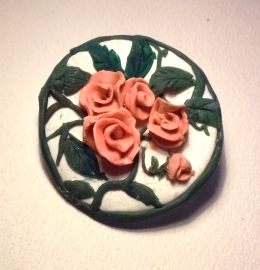 I have also enjoyed making small sculptures such as cats and garden flower brooches. At one stage I made mask brooches and recently I have been working on my Cocoon jewellery range. This unique product combines contrasting surfaces of polymer clay and kiln formed glass, usually dichroic,but sometimes hand painted recycled and tin float glass. After oven firing the creations are extremly hard. Come and see the works in progress from 9a.m. to 3 p.m. You can even buy some polymer clay to try for yourself. This entry was posted in Uncategorized and tagged art demonstration, brooches, cocon, Fimo, glass jewellery, handcrafted jewellery, kiln formed glass, meet the artist, mice, original jewellery, Oven baked clay, pendants, Penguin Market, polymer clay.